GSM ArenaThis is only a tiny portion of all Samsung’s phones. For years, this was the main criticism of Samsung: The company isn’t really innovative, it simply throws out a tonne of different products and then looks to see which ones stick. Look at its smartphone product lineup, which features dozens — maybe hundreds? — of different models and versions of those models. 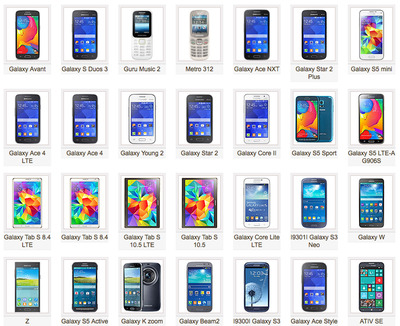 This image, from a phone sales web site, gives you an idea of how comically extensive Samsung’s phone lineup is. 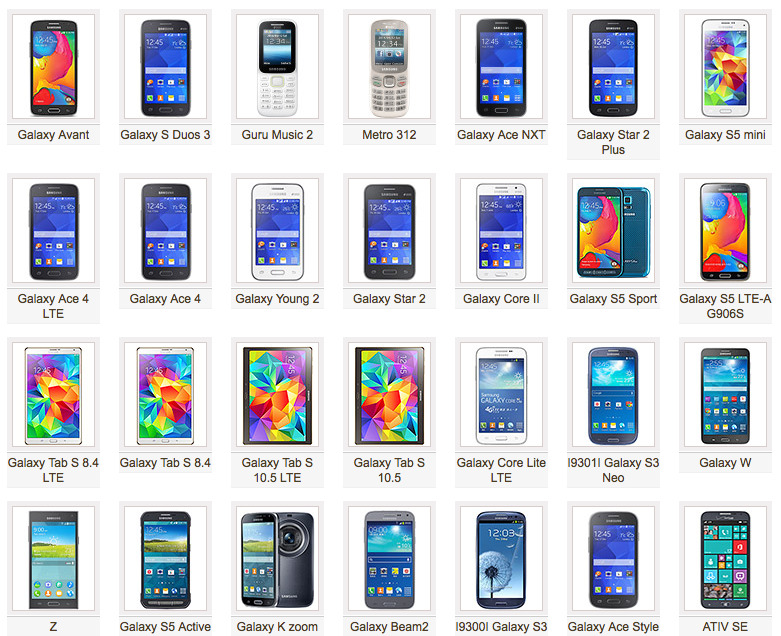 It shows only a tiny portion of Samsung’s countless phones. Which phone would you prefer, the Galaxy S Duos 3 or the Galaxy Ace NXT? Who knew Samsung even made either one? Now, Samsung is rationalising its product line, by cutting up to one third of its product lineup. If another company had done that, take consumer products company Procter & Gamble, for example, that would be huge news. Chinese phone makers like Xiaomi are manufacturing cheap but stylish Android phones, which offer better value for money than Samsung’s lower-tier cheap Androids. Apple’s iPhone 6 has waded into the high-price big-screen smartphone category, and will likely take a huge chunk of market share there. That category was recently dominated by Samsung’s Galaxy S and Note lines. No longer. The company is being squeezed at both the top and bottom of the market, in other words. That wasn’t so much of a problem when the main competition was on low-margin phones where there are few profits. But now Apple is forcing a real choice in terms of big-screen, high-end phones. So now Samsung must act. Fewer phones will reduce its manufacturing costs, making Samsung more profitable. It should also focus Samsung’s legendarily gargantuan marketing budget, bringing further efficiencies. That added focus ought to help Samsung do the one thing it has always done really well: Flood the market with the remaining phones that are succeeding with customers. At the low-price Android end, Samsung is having its lunch eaten in China by Xiaomi. The Chinese company just overtook Samsung as the No.1 seller there. Samsung needs to fight back by offering something like a stripped down, cheap version of the Galaxy S5, with its hardware mostly intact. A small, budget phone with lousy hardware won’t cut it there. Samsung needs to copy the miracle that Xiaomi has wrought, offering a superior phone at a low price. On the high end, Samsung’s problem is difficult. Apple is setting the pace here. Although the Galaxy S5 and the Note 4 have comparable features to Apple’s iPhone 6 and iPhone 6 Plus, Samsung’s problem is that customers will have a choice of buying a £500 ($US700) Samsung Android or another Android several hundred price points below that. It’s difficult to make the case that consumers should spend top dollar for Android when the entire advantage of Android is that it’s a lot cheaper than iPhone, and you get pretty much the same thing. Samsung will need to make some serious decisions about that. The company does have the talent to innovate on the Android platform successfully — the Note 4 is a seriously great phone. The S-Pen writing/drawing stylus is a genuine treat to use (and if Apple had come up with it the tech blogosphere would be cheering). But Samsung has a habit of cluttering up its great hardware with a bunch of Samsung-branded stuff that no one ever asks for in the store. The company needs a creative director with taste and focus, and — crucially — the power to say no to the company’s many, many partners and stakeholders. The battle is existential: The company is already seeing its market disappear. If Samsung doesn’t develop the focus and discipline to stay on course it knows what will happen: Relegation to the sub-brand phone layer occupied by HTC, LG and others — companies that make perfectly good phones that no one cares about.